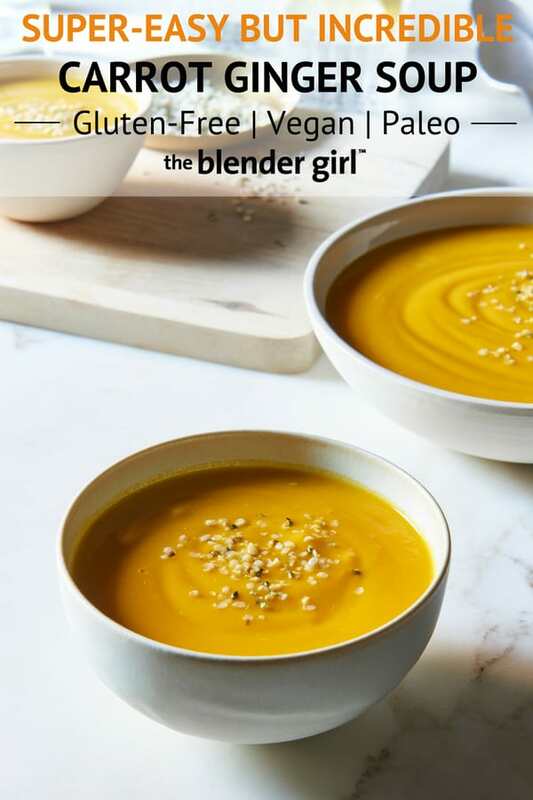 This super easy carrot ginger soup uses just 6 ingredients and is vegan and gluten-free. This recipe is kid-friendly and simple but has fabulous flavor. I got this carrot ginger soup out of the Weelicious cookbook. 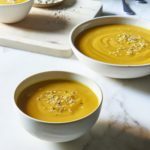 Catherine McCord has built a massive brand on the internet sharing fast, fresh, and easy recipes with simple ingredients for busy moms and families. She has a great motto: One Family. One Meal. You can find recipes for babies, toddlers, children, and families on the Weelicious website. Plus Catherine has an incredible YouTube channel with fun recipe videos. 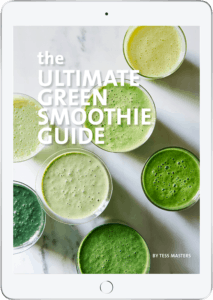 Check out the video we did together last year sharing my tastes-like-ice-cream kale smoothie. Catherine and her super easy recipes have been featured everywhere like Today, Good Morning America, The Chew, The Doctors, Fox News, Parenting, Daily Candy, and many other media outlets. You can also watch Catherine as judge on Guy’s Grocery Games for Food Network. She has such a lovely, gentle, fun, and relaxed attitude, and is one of the most generous people I’ve met in the blogging world. If you’re a busy mother looking for fast recipes, the Weelicious cookbook is for you! Catherine shares great tips for getting kids excited about vegetables, great strategies for getting them involved in the food prep, food shopping with kids to set yourself up for success, how to get the best quality ingredients on a budget, creating a family-friendly pantry, and all kinds of ideas for how to make food fun! Then there’s the recipes. The book opens with awesome purees for babies, then launches into kid-friendly breakfast ideas for pancakes, waffles, oatmeal, parfaits, and oatmeal-on-the-go bars. I love the soup section that has a wonderful variety of simple family-friendly soups. Dips, sauces, and salsas are such key staples for kids, and Catherine has a great selection in the book. The Red Beet and White Bean Hummus is a gorgeous vibrant pink color and the Broccoli Pesto is a beautiful green. I also love the avocado dressings and dips, and the edamame salsa. Choose from easy snacks like apple cinnamon sticks, sunflower seed brittle, parsnip muffins, chewy granola balls, and all kinds of fruit pops. For family-friendly meals, there’s a fabulous brown rice and veggie casserole, veg-wee burgers, and cold sesame soba noodles, and spaghetti pie. I love the veggie nuggets in the shape of animals, the potato pea cakes, the fried green beans, and the baked zucchini coins. There is, of course, a full repertoire of sweet kiddy treats: love the chocolate rice crisp-wee treats, banana-oat-chocolate-chip cookies, strawberr-wee lemonade, pink veggie smoothie, and a great avocado shake! Get your copy of the Weelicious cookbook and find more family-friendly recipes at Weelicious. In a medium saucepan over medium heat, warm the olive oil, and sauté the onion with a pinch of the salt for about 5 minutes until soft and translucent. Add the broth, carrots, ginger, and salt, increase the heat to high, and bring the mixture to a boil. Reduce the heat to medium-low, and simmer for 15 to 20 minutes, until the carrots are fork-tender. Transfer the soup to a blender, and blast on high for 30 to 60 seconds, until smooth and creamy.